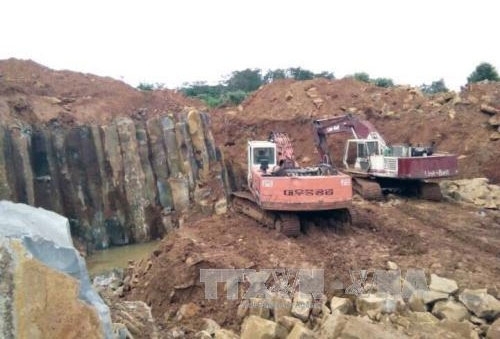 Illegal stone mining activities have been going on since April in Đak Nong province’s Đak Kut Quarry, but no action has been taken against violators. Last month, after Vietnam News Agency (VNA) published multiple reports on illegal quarrying at Đak Kut Quarry in Gia Nghia town’s Đak Tan village, the provincial People’s Committee set up a special working group to look into the issue. A decision signed by Truong Thanh Tung, Vice Chairman of the provincial People’s Committee, said the group would include leaders of the provincial natural resources and environment department, the provincial police and the people’s committees of Gia Nghia town and Dak Nia commune. Dam Quang Trung, Director of the provincial Natural Resources and Environment Department, was appointed head of the group. The group was asked to inspect the quarry and figure out what illegal mining was being done, those involved in the activity as well as the responsibilities of the various State agencies in the incident. It was to hand over its report to the People’s Committee before December 20. On December 20, however, when the working group held a meeting to share its assessment and offer solutions, representatives of the provincial police department and Gia Nghia town’s People’s Committee were absent. At the meeting, the working group asked related authorities to work with representatives of Duy Quang Commerce JSC, the alleged violator, before December 30 to define the company’s illegal mining activity and come up with appropriate punishments. It also asked Gia Nghia and Dak Nia authorities to report on the responsibilities of those involved in the case before December 26, and asked the provincial police department to report on the two trucks carrying stones that were seized in September. However, so far, the group has received no responses. The working group has also asked the provincial authority to postpone the deadline of the final report to January 15, saying that the incident was “complicated” and “needed time to be resolved”. Last October, the VNA reported illegal mining in Đak Tan village, which is around a kilometre from Dak Nia commune’s People’s Committee office. Stones were piled up two to three metres high and spread over 0.5m in the quarry. A group of five workers were seen working with machines and loading stones in trucks. Hoang Van Ten, head of Dak Tan village, said that stone quarrying had been going on since last April, making the area noisy and dusty, and damaging the village roads. When VNA reporters asked Dong Quang Huy, chairman of the People’s Committee, he said the committee had no idea who was behind the illegal quarrying.